The Mask nebula is a bipolar planetary nebula (PN G321.6+02.2) about 6500 light years distant in the southern constellation of Circinus. �It is about 8 arcminutes in length, including the bright core�that looks like a ski mask, and�the extensions. �According to Corradi et al. (“A New, Evolved Bipolar Planetary Nebula”, Astron. Astrophys., v224, 276-280, 1997), it is an evolved planetary nebula with a kinematic age of >12,000 years, very large in size at about 13 light years across, and has a very hot, yet unobserved central star that is hotter than 130,000K. �I used a 5 nm hydrogen-alpha narrowband filter to pick the emissions of both H-a and Nitrogen (NII), since Corradi et al. mentioned that this PN emits much more NII than H-a. 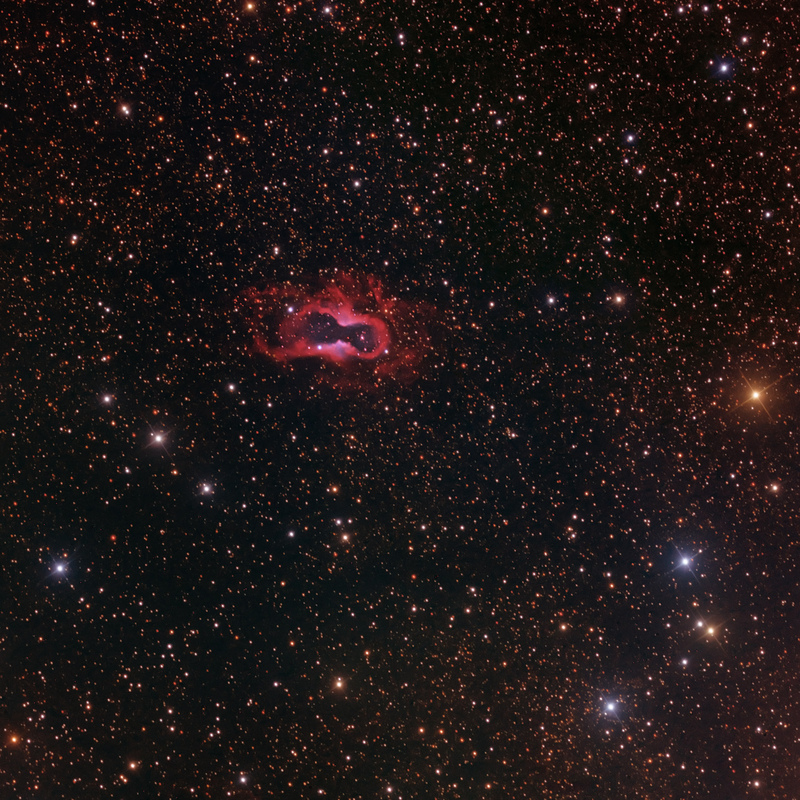 The oxygen (OIII) contributes to the brighter regions near the “waist” or constriction of the nebula.